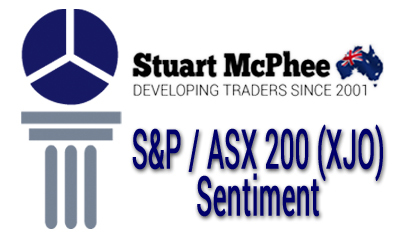 For the week beginning 9 October 2017, my very own Stuart McPhee Market Sentiment Indicator for the S&P/ASX 200 Index (XJO) remains well below 50 again as the ASX200 index struggles to stay above the current support level at 5650. See below for notes on the indicator. Click on the image below for a larger, clearer image of the S&P/ASX 200 Index. My very own Stuart McPhee Market Sentiment Indicator provides a general summary of how bullish or bearish the market is by providing a value between 0 and 100. This can provide you guidance on how committed you should be to stocks and therefore how much money you would consider committing from your entire portfolio to stocks alone. It could also provide some indication of your bias between long and short positions in your ASX portfolio. For example, if the indicator is reading neutral, you may only consider taking partial positions in stocks you purchase. If the indicator was reading bullish, you may not impose any restrictions on your trades and conversely, if the indicator was reading bearish, you may be more selective with which trades you take, or be more open to taking more short trades. Naturally, a reading well below 50 is to be considered very bearish. Likewise, a reading well above 60 is to be considered very bullish. This material is made available by Trading Excellence Pty Ltd (ABN 11 096 024 958) (“Trading Excellence”) and Stuart McPhee who is an Authorised Representative (No 276438) of Australian Stock Report Pty Limited (AFSL 301682 – ABN 94 106 863 978)(“ASR”) and Amalgamated Australian Investment Solutions Pty Limited (AFSL 314614 – ABN 61 123 680 106)(“AAIS”). This blog is prepared and disseminated for information and discussion purposes only. It is neither an offer to buy or sell securities, or any other financial products nor a solicitation of an offer to buy securities or other financial products. To the extent that any of the content of this website constitutes advice, it is general advice as opposed to personal advice. Opinions, estimates and projections constitute the current judgement of the author as at the date of publication. They do not necessarily reflect the opinions of ASR, AAIS or any of the related entities, and are subject to change without notice. Whilst the information presented herein is believed to be reliable and sourced from public sources believed to be reliable, ASR and AAIS do not make any representation as to its accuracy or completeness. Past performance is not necessarily indicative of future results. ASR and AAIS have no obligation to update, modify or amend this publication or otherwise notify a recipient if any opinion, forecast or estimate contained herein changes or subsequently becomes inaccurate. Employees and/or associates of ASR, AAIS and its related entities may hold one or more of the stocks, securities or investments reviewed in the newsletter or on the website. Any personal holdings by employees and/or associates of ASR and AAIS and their related entities should not be seen as an endorsement or recommendation in anyway. ASR and AAIS’ Privacy Statement and Financial Services Guide can be obtained upon request. No part of this document may be reproduced in any form without the prior written consent of Trading Excellence Pty Ltd.
© Trading Excellence Pty Ltd 2017. All Rights Reserved. Australian private trader for nearly 20 years, author, trading coach, licensed adviser and regular speaker at major trading events all around the world. 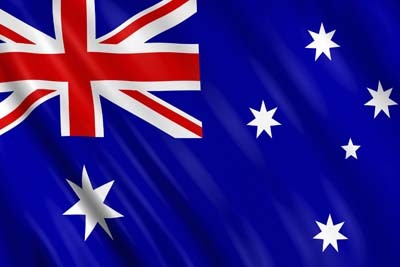 Graduate of RMC Duntroon and former Australian Army Officer. © 2017 Trading Excellence Pty Ltd. Stuart McPhee is an Authorised Representative (No 276438) of Australian Stock Report Pty Limited (AFSL 301682 – ABN 94 106 863 978) and Amalgamated Australian Investment Solutions Pty Limited (AFSL 314614 – ABN 61 123 680 106).